You’ve probably heard that “TEAM” stands for “Together Everyone Achieves More.” Organizations love the “achieving” and “more” part of the acronym, but everyone still struggles with the “together” part. 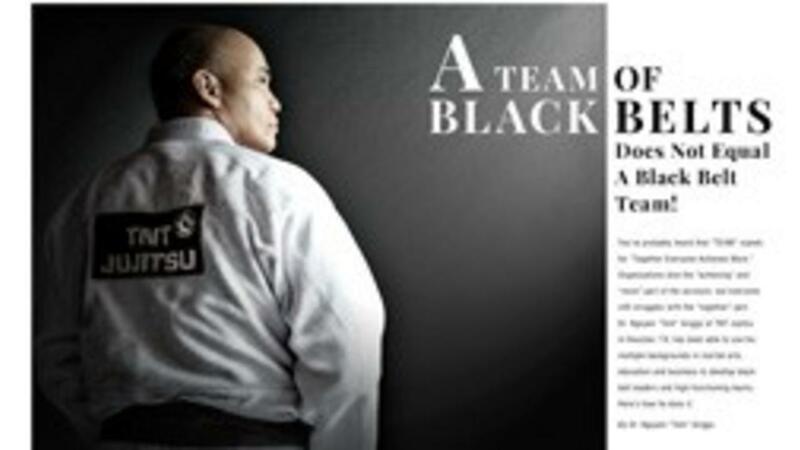 Dr. Nguyen “Tom” Griggs of TNT Jujitsu in Houston, TX, has been able to use his multiple backgrounds in martial arts, education and business to develop black belt leaders and high-functioning teams. Here’s how he does it. Dr. Griggs says there are three primary types of team models he has experienced. The first is the “Patchwork” model. This is where the sensei would tell the class about their techniques and everyone simply trained and helped teach as needed. All the higher belts understood what was asked of them, and helped to build the knowledge “quilt” by teaching techniques in the way that they felt was best. In schools with an informal and easygoing teaching style, this team model works nicely. However, it can also be problematic, because it’s very easy for things to get too loose and unstructured. The next model is known as the “Rock Star” team model. This is where students who won medals or trophies were given teaching and leadership roles. These people have some level of rank and usually teach according to class/age levels. But, they attain leadership roles through their accomplishments in competition. A major benefit to the Rock Star model is that your team of instructors and leaders knows what it takes to win. The flipside of this model, however, is that there’s an assumption that winners are leaders and teachers. Whether you’re a great competitor or a top sales earner, it doesn’t necessarily make you leadership material. If you want proof, look at the programs and materials focusing on instructor training and leadership development. Medals, trophies and titles show your ability to beat — not teach and lead — other people. The last model is known as the “Old School” model. The Old-School model emphasizes attention, focus and patience, thereby allowing people to bond and learn the curriculum. One of the main problems with doing it “Old School” is that teams can become very much like exclusive clubs. People that want to contribute might feel excluded and not valued, because they haven’t put in enough time or they’re not part of the leadership team. An obvious solution for this is to hear people out, no matter what their role is in your school. A related problem is that some Old-School thinkers tend to adhere to the “If-it-ain’t-broke-don’t-fix-it” mindset, which can hinder innovation and change. Dr. Griggs’s school had some issues with Old-School thinking, but made great strides in being more open and inclusive. They implemented one solution to deal with this problem. They allow a student or parent to try his or her idea out (depending upon the idea) on a smaller scale and showcase the results. If they see an idea working, they explore and implement it further. All of these models (Patchwork, Rock Star and Old-School) teach everal valuable lessons. One lesson is that all schools and gyms have various models of teamwork, and we all probably are a blend of these types. Secondly, no model is perfect. Being fluid, but grounded in your mission, is a key to helping create successful teams.